You might have already seen on our social media pages that we were chosen to be in the second wave of Painters in Residence for the lovely Annie Sloan of Chalk Paint® fame! We couldn't be more honoured and delighted, and we're thrilled to have our work introduced to her legions of fans across the world. The first project we created - The Succulent Chaise - went online a few weeks ago, while we were away in New York (more on that, soon) and we're delighted to share a little more about it here. It was certainly a labour of love, and it took me several weeks of hand-painting to complete the piece, but I just love the finished article, and you know me, I LOVE that it's covered in succulents! On to the wood-work, I used Florence (it was a close run thing with Antibes!) for all-over the woodwork and then used Aubusson to highlight the trimmed area. I then applied two coats of clear wax and buffed it with a cloth for a bit of a sheen. I decided not to wax the upholstered area because it is going to be a purely decorative piece, though our dog Hamish had a wee sit on it when we weren't looking... I was also worried the pen I used might run if I waxed it, and didn't want to risk it after all the hours of painting! Overall, we're just delighted with this project and the reaction we've received online is just lovely. We can't wait until the next project is revealed and we can share it with you here, too. Please let me know if you have any questions about this project, and I will do my best to answer them! 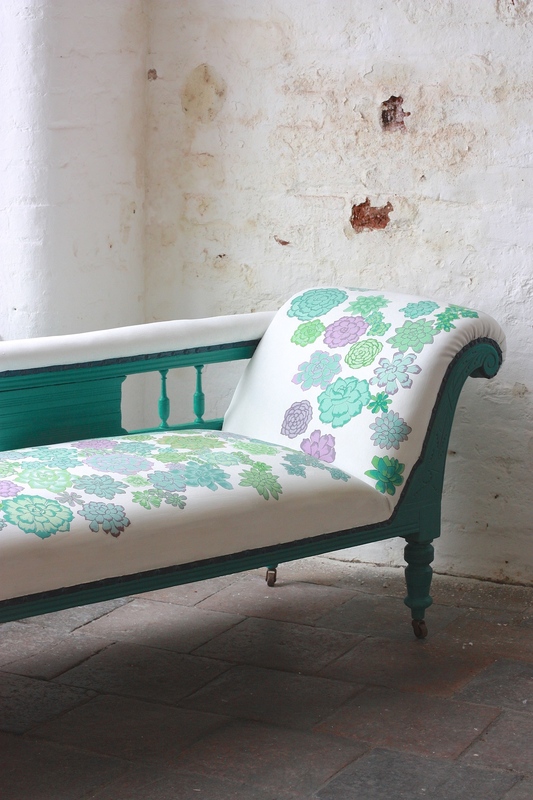 Have you ever intricately painted a piece of furniture? Fun, isn't it?! You can read more about this project over on Annie's blog, too.